Anyone who knows me would tell you that as long as the discussion stays civil, I’m more than happy to sit and discuss politics over coffee or a meal. However, I try hard to avoid political discussion in any online setting. 1) It takes (me) a lot of time to write thoughtful, insightful, well-reasoned commentary. I don’t have the time (nor the skill probably) to write *well*. With verbal, face-to-face communication you still have to be thoughtful, insightful, and reasoned but you have the benefit of immediate rebuttal and explanatory remarks. You also have the advantage of seeing facial expressions and hearing the “tone” of the conversation. 2) The Kevin Bacon theory…There are six degrees of separation between the “I don’t agree with that” comment and the guy who says, “You’re a !#$%#$! jerk and your mother wears army boots”. People are very brave (and thoughtless) over an internet connection. What a waste of time. Now that I’m thinking about it I’d say it’s usually only 2-3 degrees of separation. 3) Discussions often end up in a barrage of anecdotes flying back and forth. Healthcare debates are a great example — “So and so died because they didn’t have health insurance” vs “So and so died because such and such country’s healthcare bureaucracy prevented them from getting care”. Both stories may be true…but did you really get anywhere in the discussion? Anecdotes have their place but IMO a handful of anecdotes are not a sufficient basis for most policy decisions. 3a) Candidate discussions tend to focus on anecdotes as well. In any discussion about imperfect humans there will be no shortage of flaws to point out. A candidate’s character, skeletons, inconsistencies (real or apparent), etc. are all important to evaluate. However, at some point one needs to make a judgment about who will do the best job, do the right things, etc. Online discussions of political figures rarely seem to get there…they’re mostly just rants about people you really only know through carefully-crafted sound bites (pro and con) and a few sentences of print. 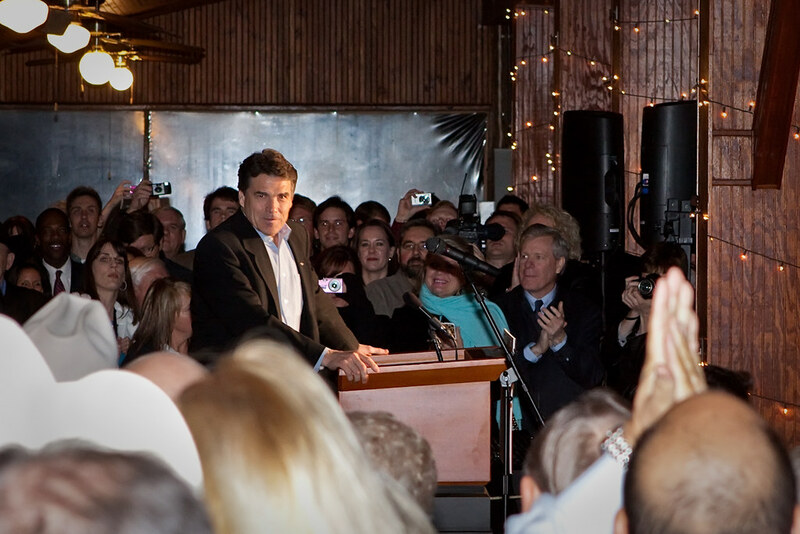 So…about that photo of Texas Governor Rick Perry. The Texas primary elections were held this past Tuesday. I’ll skip the details but my daughter and I ended up getting invited by a new acquaintance to Governor Rick Perry’s election watch party at the Salt Lick BBQ restaurant in Driftwood, TX. The Salt Lick is right around the corner from my house so we decided to join in. I stopped by my house and grabbed the camera and flash and headed over there. Once inside we took care of “first things first” — hit the buffet line and ate some great BBQ. 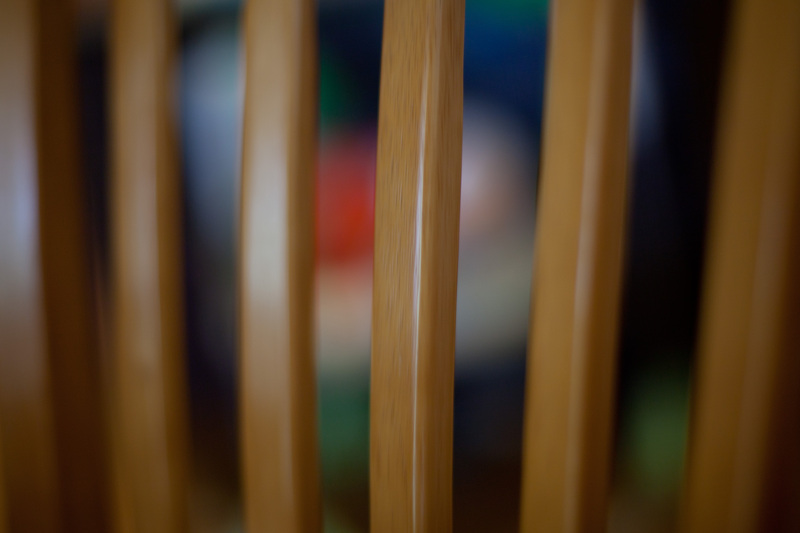 I was using a Canon 50D with a 24-70mm f/2.8 lens with my 580EXii on camera. I was fairly close to the action but had to experiment quite a bit with settings. The first problem I had was blown out highlights. The Salt Lick Pavilion is relatively dark and has dark wood on the walls and ceiling. The camera automatically thinks it needs a bunch of flash to light the scene. However, the main subject (the governor in the shot above) actually needs very little light due to the bazillion watts of light from the news orgs at camera right. When I let the camera have complete control with no compensation the governor’s face (at least the side toward the news lights) was completely blown out. I tried bouncing the flash — “no worky” — those dark wood ceilings and walls eat almost all the light. I had to shoot with the flash pointed straight at the governor then I experimented with a combination of dialing down both exposure and flash compensation to get my preferred combination of governor and background. I really just needed enough to see the crowd a bit and fill some shadows on the governor. Then there were all those other flashes going off which messed things up here and there…was a great photography learning experience. 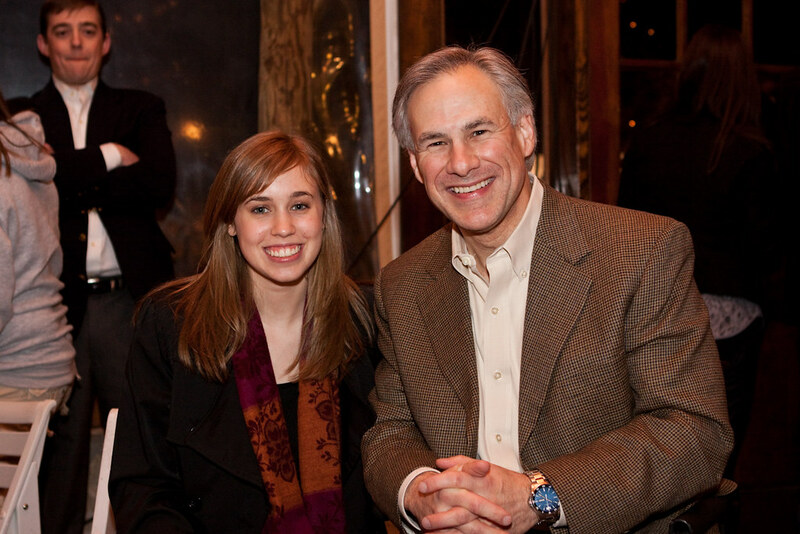 I also took this shot below of my daughter with Texas Attorney General Greg Abbott. Notice that there are almost no shadows on the faces. I did have the flash partially bounced off the ceiling here but the lack of shadow under the nose shows that almost all the exposure came from the part of the light that went directly from the flash to the faces. That’s my reading of the situation anyway. Love the face of that guy in the background! We actually had a great time and met some interesting (in a good way) people at the event. I also learned some photography lessons along the way. Practice makes perfect.